Small Well Behaved Dogs Welcome. Exclusive *Beachfront* Pemberton Park Lane Lodge (40x14ft). 2 Bedrooms. 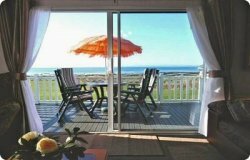 Stunning Sea Views, Enclosed Veranda with Patio Furniture. Find same caravan on other sites cheaper & we will Beat the Price! Spacious Lounge 2 free standing leather sofas (1 which is a sofa bed). Armchair. Wall mounted Flat Screen TV/ DVD. The large veranda with full sea views, patio furniture and exterior lighting is accessible from full width sliding patio doors to the front and side of lounge area. Large Kitchen with integrated Cooker (5 burner hob) with separate Oven, Grill and Microwave. Full Size Fridge/Freezer, all crockery, pots and pans etc. Dining Area with Dining Table and Chairs. Family Bathroom has fitted Half-moon Corner Bath, WC, Wash hand basin, mixer taps. Master Bedroom with fitted wardrobe, drawers and dressing table. 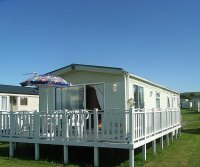 Full Sprung Double Bed and en-suite facilities [Shower, wash hand basin and WC]. TV/DVD. Twin Bedroom has 2 fully sprung single beds which are moveable to form a Double Bed. Wardrobe and Drawers. This is actual photographs of the caravan and not catalogue photos. Location: 5 minute stroll to complex and shops. Frontline to beach.